When villagers in southwestern Turkey found a dead bird with a metal ring round its leg stamped "Israel", they reached the obvious conclusion – that the bird had been sent from Israel to spy on Turkey. Local police discovered that the bird had unusually large nostrils, in which they suspected a microchip may have been hidden. A special counter-terrorism unit of the police also became involved, perhaps suspecting that the bird may have been trying to make contact with Kurdish separatists or other extremists operating within Turkey. 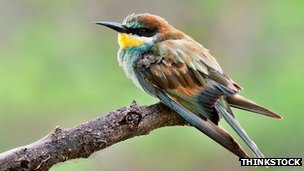 Officials from the Turkish Ministry of Agriculture eventually managed to convince locals and the police that the bird – a common European bee-eater – was not a threat to national security and had merely been tagged in the Zionist Entity as part of a routine tracking of the movements of migratory birds. But why were the Ministry officials so keen to dampen down concerns as to the bird's true purpose? Whose orders were they following?